Bárbara of Portugal (Pronunciation IPA: ['baɾbɐɾɐ], December 4, 1711 – August 27, 1758) was a Portuguese princess, daughter of King John V of Portugal, of the House of Braganza, and his wife, Maria Anna of Austria. 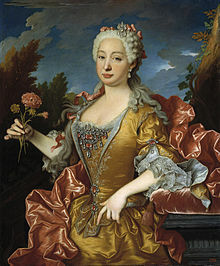 She was born on 4 December 1711 in Lisbon, Portugal and given the name Maria Madalena Bárbara Xavier Leonor Teresa Antónia Josefa de Bragança but she was usually called just Bárbara or Maria Bárbara, in honour of Saint Barbara, the saint of her birthday. She had a fine education and loved music. She could speak six languages and studied music for several years with Domenico Scarlatti, the famous Italian harpsichordist and composer. In 1729, when she was 18 years old, she married the future King Ferdinand VI of Spain, in Badajoz, Spain. They had no children. She died on 27 August 1758 in Aranjuez, Spain. The city of Santa Bárbara de Samaná in the Dominican Republic was named after her when it was founded in 1756. This page was last changed on 31 October 2014, at 11:13.